Apple unveiled today the new generation Watch called Apple Watch Series 2. It keeps the same shape and design, but upgrades on the water resistance, performance, and connectivity. While the new Apple Watch Series 2 looks pretty much the same, it is now water-proof and can go up to 50 meters underwater. There is no time limit, Apple says it tested these Series 2 watches for weeks. The speaker in the new Watch is the only place where air can get and it is now designed to automatically push the water out after a swim workout. The Watch Series 2 comes with integrated GPS, so you can now leave your iPhone at home. It also upgrades on the CPU and GPU with the new Apple S2 SiP - the processor is now dual-core for up to 50% performance increase. The GPU in the Apple S2 also granted an up to 2x speed bump. The new Watch Series 2 features two times brighter display that can reach 1000 nits - the brightest display Apple has ever shipped. Apple Watch Series 2 will come in the regular 38 and 42mm editions available in aluminum and stainless steel. There is also a new Ceramic model in white paintjob, four times tougher than the steel one. It can use any of the available bands. Apple is also launching Apple Watch Series 2 Nike+ Edition with exclusive Nike band. The Watch Series 2 runs on watchOS 3 and is capable of super accurately calculating swimming workouts and burnt calories. Apple Watch Series 2 pricing starts at $369 and the Nike+ Edition will cost the same. The pre-orders kick off on September 9, while the Watch Series 2 will launch on September 16. Apple is also upgrading its original Watch - it's now called Apple Watch Series 1 with the same dual-core processor found in the new Apple S2 SiP. The price goes down to $269. Finally, the new watchOS 3 will become available for the current generation Watches on September 13. Apple Watch is available in two different case sizes, 38 mm and 42 mm. 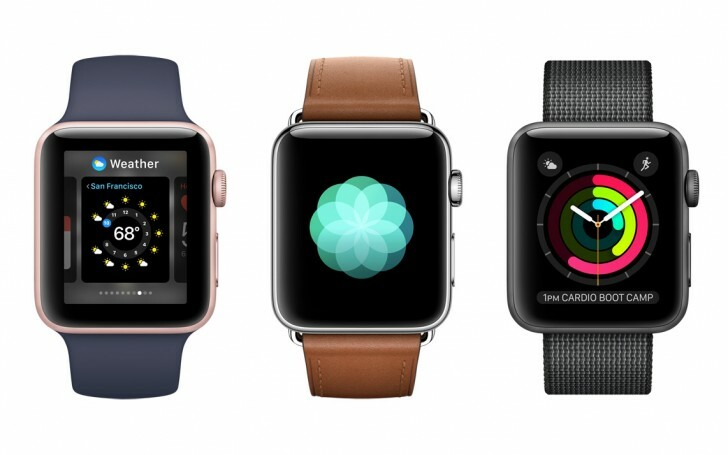 Apple Watch Series 1 will be available in gold, rose gold, silver or space gray aluminum cases paired with a Sport Band and starts at just $269 (US); Apple Watch Series 2 will be available in gold, rose gold, silver or space gray aluminum, or silver or space black stainless steel cases paired with a wide variety of bands starting at $369 (US); and the new ceramic Apple Watch Edition starts at $1249 (US) from apple.com, Apple Stores and select Apple Authorized Resellers and carriers. For local availability, visit locate.apple.com. Apple Watch Nike+ starts at $369 (US) and Apple Watch Hermès starts at $1149 (US). All-new Apple Watch Band Kits in gorgeous new colors are available, beginning today. Customers will be able to order Apple Watch Series 1, Apple Watch Series 2 and Apple Watch Edition beginning Friday, September 9, with availability beginning Friday, September 16, in Australia, Austria, Belgium, Canada, China, Denmark, Finland, France, Germany, Hong Kong, Ireland, Italy, Japan, Luxembourg, Netherlands, New Zealand, Norway, Portugal, Puerto Rico, Singapore, Spain, Sweden, Switzerland, Taiwan, UAE, the UK and the US. Apple Watch Nike+ will be available to order on apple.com beginning Friday, September 9, with availability in late October, in Australia, Austria, Belgium, Canada, China, Costa Rica, Denmark, Finland, France, Germany, Hong Kong, India, Ireland, Israel, Italy, Japan, Luxembourg, Mexico, Netherlands, New Zealand, Norway, Poland, Portugal, Puerto Rico, Singapore, Spain, Sweden, Switzerland, Taiwan, UAE, the UK and the US. Apple Watch Hermès will be available beginning Friday, September 23 in Australia, Belgium, Canada, China, France, Germany, Hong Kong, Italy, Japan, Macau, Russia, Singapore, Spain, Switzerland, Taiwan, UAE, the UK and the US. Apple Watch Series 1, Apple Watch Series 2 and Apple Watch Edition will be available beginning Friday, September 23 in Anguilla, Antigua and Barbuda, Cayman Islands, Croatia, Czech Republic, El Salvador, Greece, Guam, Hungary, Jersey, Kuwait, Macau, Monaco, Poland, Qatar, Romania, Russia, Saudi Arabia, Slovakia and the US Virgin Islands. Apple Watch Series 1, Apple Watch Series 2 and Apple Watch Edition will be available beginning Friday, October 7 in India and Mexico. Apple Watch Series 2 requires iPhone 5 or later running iOS 10 or later. watchOS 3 and iOS 10 will be available beginning Tuesday, September 13 as a free software update. Some features are not available in all regions or all languages. Every customer who buys Apple Watch from Apple will be offered free Personal Setup, in-store or online, to help set up and personalize their new Apple Watch with calendars, notifications, apps and more. Anyone who wants to learn more about Apple Watch or watchOS 3 can register for the free workshops offered at every Apple Store. yeah i tried apple watch at store, i did not liked the design,so if the new watch has same design and battery as previous, what is there to like. Now make it a phone and pair it to the bluetooth earpods. Job done.